For the past several months I’ve become enamored with the idea of creating a self sufficient, connectionless home. Not only is the home off-grid, creating it’s own power, heat, and air-conditioning, but also it’s own water supply, compost, and sewage system in a smart home environment. I’ve even imagined how a house like this could be constructed with a form of 3D printing called contour crafting. The entire house could be designed and built one drop at a time, with everything from windows, wiring, and plumbing meticulously “printed” into place. Going even further, every surface could have sensors, solar cells, and smart devices with unusual capabilities and functionality embedded into the wall, floors, and ceilings. Micro LEDs, audio systems, and air handlers could even anticipate your mood and adjust themselves according to your changing whims. In fact, this ultimate off-grid smart home would be so intelligent that it would circumvent every paid service plan to provide all these services. That’s right, everything would be totally free. Free power, free water, free security systems, free heating and air-conditioning. I had become so captivated by the disruptive notion of “free,” that I was missing the bigger picture. Only in the past couple days have I come to realize that I was thinking about this all wrong. Each of us has formed an adversarial relationship with our homes. Our homes are not operating in our best interests. They’re “dumb” structures, needing cleaning and repair, unable to think on their own, and every feature we wish to add costs us more money. Over the years, we’ve all become complacent in our thinking, resigned to accept “that’s just the way it is.” None of us has imagined that there could actually be a better option, but there truly is. The Maslow Self Actualization home is one that forms a symbiotic relationship with each of its residents, and over time, begins to climb the famed pyramid to imbue the power of self-actualization onto those who inhabit it. Here’s how I see the stages of this higher order living begin to unfold. Even though most people have little to no understanding of what a “smart home” actually is, companies have been actively creating a wide range of smart home technologies ranging from smart thermostats, to smart security systems, to smart pet doors, to smart entertainment systems. The Internet of Things is alive and well and already taking up residence in our homes. These devices not only communicate with the residents of the homes, they also communicate with each other. As these smart devices grow in sensory capability as well as in their ability to respond to each new condition, an entirely new kind of home begins to emerge. Many people are enamored with the idea of creating an off-grid living space, erroneously thinking that if we remove the power lines and grow a few plants, that we will somehow have instant utopia. To set the record straight, we will never reach the point of creating a complete utopia. As flawed humans, what we think we want is always different than what we need, and all humans need to struggle. At the same time, if we struggle far less with our homes, it frees us up to dedicate time and energy to struggle with problems far more deserving of our time and energy. With that in mind, here is a crude sketch of the eight stages, both where we’ve come from and where we’re likely to go with the increasingly intimate relationship we form with our homes. In the beginning, every home was a shelter and little more. It protected people from wind and rain, but not much else. Most of us today have a stage 2 home that provides both safety and shelter. Not only are we protected from the elements, but we also feel safe from intruders and any other dangers that lurk in the night. Homes today are a lot of work. We still need to do our own cleaning and repair, insuring it against disaster, and pay for every service we wish to add. 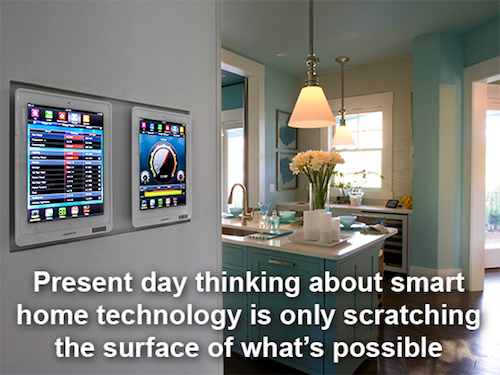 With all of the buzz surrounding smart homes and smart home technology, it’s amazing that so few people actually know what it is. In much the same way doors at our local grocery stores automatically open as we approach, today’s smart homes are designed to grow one feature at a time, using sensors to detect people, pets, and weather conditions, each connected to devices that automatically adjust to the situation. As smart home devices become smarter, they will begin to shift from simply responding to a condition, to anticipating what’s next. A smart anticipatory home will not only know what mood you’re in, but will also anticipate what kind of music, lighting, and fire in the fireplace will suit your needs. These homes will have the intelligence to know both where you are, and who you are, building complicated anticipatory profiles for everyone who walks in the front door, keeping rooms tidy, picked up, and clean at all times. In stage 5 we are finally getting to the point where homes not only create their own power, heat, air-conditioning, and water, but also manage their own trash, sewage, external communications, and more. Going a few steps further, a self-sufficient home will also have the ability to grow and harvest food, and prepare it for human consumption. While this may be difficult for most to imagine, the morphing home will seem alive as it actually changes its size and shape to better accommodate our lifestyle. As an example, if you’re hosting a party, some rooms will expand while others contract to form the best possible spaces for the event. Eventually, even outer walls will have the ability to shift, change color, and expand according to the needs of the inhabitants. Crafted with organic matter, these homes will harbor a companionship type of relationship with their residents, responding to pain and injury by producing healing environments, altering oxygen levels, and producing salves and ointments seemingly from thin air. A symbiotic home is also a talking home, conversationally literate, able to communicate through words and actions regardless of age, ethnicity, language, or profession. This final stage puts it all together, combining the symbiotic relationship that we form with our home, anticipating our needs, morphing itself in shape and size, creating it’s own power, lights, music, media, and communication with the rest of the world, as our daily living becomes second nature. Our homes become an integral part of who we are, our friend and confidant, an extension of our humanness, attentive to our desires, but knowing when we’ve reached our limits. In a form of grid communication system self-actualization houses will have the ability to communicate with neighboring self-actualization houses, detecting changes in surrounding condition, anticipating dangers, tracking lost children and pets, and building resilience into every possible lifestyle. Moving past the point of sensors, apps, devices, and mechanical hardware, the self-actualization house will become a living, breathing extension of who we are, amplifying our desires, assisting in our accomplishments, and tending to our needs so we can become we can better fulfill our aspirations. In short, the self-actualization house will make you a better you. On the day we’re born, we begin to form a relationship with the home we live in. As youngsters growing up, our home is our universe, our fortress, our source of food and family, and the place we spend most of our sleeping and waking hours. As we get older, the home serves more as a base station, where we periodically check in, but it’s the place where we keep our belongings, our entertainment, and a central gathering place for the rest of our family. Those of us without a stable home life know how disconcerting it can be as we form temporary attachments to places that provide shelter and separate attachments to places where we find food, heat, and social connections. People without a stable base of operation have difficulty forming the foundational underpinnings for themselves to personally climb the Maslow hierarchy of need. For this reason, the home should never be considered the soulless commodity that it is today. Rather, the further we can move our homes up the pyramid of need, the closer we get to achieving self-actualization ourselves. We have great difficulty imagining a future home with these types of capabilities. My goal in writing this column has been to help think beyond the incremental accomplishments of advanced living. Admittedly, these brief descriptions are a crude way of describing each of the stages and the steps necessary to move beyond the traditional “home as shelter” thinking. At the same time, I’d love to hear your thoughts, what’s missing, oversimplified, out of order, or completely wrongheaded. This idea came from a middle of the night epiphany and I rarely grasp the big picture with that kind of initial inspiration. But keep in mind, my house will know who you are and what you’re really thinking, so keep it clean.